For the last few years my Dad and step-mom have given Lori and I a ticket to the Patrons' Show at the Torpedo Factory in Alexandria, VA as a Christmas gift. 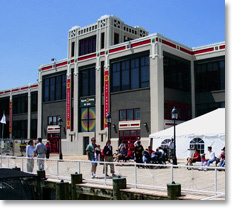 Those of you who are wondering what the Torpedo Factory is, it's an old renovated building in Old Towne Alexandria that was once actually used to (*shocker*) build torpedoes. It opened in 1918 and eventually served as a munitions storage area until World War II. 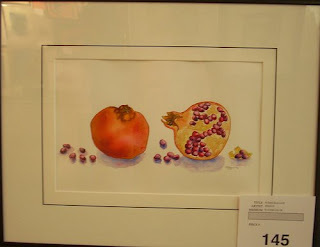 Each year the Art League (a local art organization in Northern Virginia) hold the Patrons Show which features nearly 600 original works of art donated by members of the league. One ticket (usually priced at about $150) will give you an entry into the drawing. The drawing is held on a Sunday in February every year (almost always coinciding with the Daytona 500 *NUTS! * and NBA All Star game). This year's drawing is on this upcoming Sunday at 5 PM. The process of ranking and preparing for the drawing is part of the appeal of the overall event. The donated works are on display at the Torpedo Factory for about two weeks leading up to the drawing. People who have purchased a ticket come look at the available donated pieces of art and proceed to rank them based on their own personal taste. During the actual drawing process on Sunday, one of the emcees will take turns reading off random names of people who hold a ticket. When your name is called you have a few seconds to respond loudly with the number of the work of art you want to select. Once your name is called, you are done and can pickup your art choice at the next designated break and head on home. If you shout back a number of a piece of art that is already taken, the normally docent mob of wine-drinking yuppies serenades a chorus of boos throughout the drawing hall. Before the drawing, the scene at the Torpedo Factory is very much like one you would see at a stadium before a football game except everyone is sitting in chairs sipping on wine and eating cheese instead of brats and beer. It truly is tailgating for the upper crust of society. In years past, we have had two tickets (one for each of us), but recently due to the kids, Lori and I have shared a single ticket. This means we have to compromise on our varying personal artistic tastes (she likes flowers, I like photographs and landscapes). We haven't had a chance to get to the Torpedo Factory to rank the art this year, so as we did last February, we spent tonight ranking the pieces of art online. The Art League now posts all photos on Flickr for everyone to see. Combined with a macro-laced Excel spreadsheet, we have all we need to be ready for the big drawing. I'll be heading over for the drawing on Sunday while Lori takes the kids to a friend's 2nd birthday party. The wait for hearing your name at the drawing can be short-lived or excruciatingly long. I remember when my brother was one of the last people picked a few years ago (I had already left and was at home watching the All-Star game when his name was called). My Dad and Lauren, my brother and his wife and some other friends will all be there with their own tickets, so hopefully even if I get my name called out late I won't be the last one standing. The very last person called gets a special prize for being the final ticket and gets a free entry into next year's drawing. 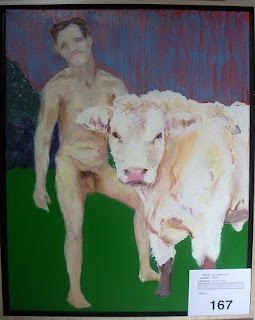 To show you what the range of art available at the show I have listed our favorite piece below. Followed by our LEAST favorite piece (for obvious reasons). The interesting aspect to the selection process is that someone will actually select this piece. I am sure this will not be the last painting taken as there are always some people with oddball taste in art that will actually WANT this painting. I will post a small recap after the event and a picture of the work of art we eventually end up with. Hopefully it won't involve naked men and/or cows. This sounds so interesting. Quite a bit of work to organize. I love the one you picked as your favorite.